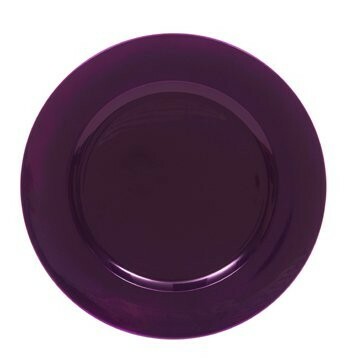 Home > Products > ChargeIt by Jay Round Metallic Purple Charger Plate 13"
Set a stylish and eye-catching table with the ChargeIt by Jay Round Metallic Purple Charger Plate 13". Boasting a vibrant purple metallic finish, this product adds a touch of sparkle and shine to your outdoor reception, formal dining, or banquet. Thanks to its lightweight melamine construction, this item is exceptionally durable for years of use. Perfect for presenting multi-course meals, this charger plate with a 13" diameter accommodates standard size plates. For proper cleaning and maintenance, hand washing is recommended.